"Dozens of Deep-Space Outstations are scattered across the Interstellar void of the Terran Empire. Light-years from any inhabited worlds, they are completely self-contained. These huge constructs are fitted with extensive docking and repair bays as well as guest accommodations for thousands. 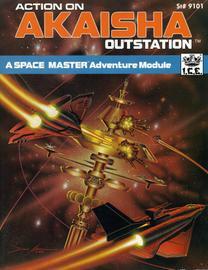 Located on the edge of Delta "C" Sector, Akaisha Outstation is on the borders of Devonian Provincial Space. Beyond is Imperial territory, and nearby are possessions of Houses Colos and Jade-London. (3) Catch thieves dealing in priceless artifacts." Set on a rocky pinnacle in the center of an ancient crater, Cygnus Corp's Ardinium ore processing plant Number 27 glows a metallic gold in the hazy sunrise. It is a rare appearance for Tara's star, usually lost behind a curtain of smog and acidic drizzle. The weary, merely-human workers return to the plant for another long day of labour amidst the untiring machines built by their superiors, the superhuman Kashmerians of 69 Cygni. The Cygnans are their masters. "Slavery thrives in this corner of the Terran Empire," cry, the horrified liberals in the Imperial Senate. "We are elevating them to our level of technology and culture." retort the Cygnans (who fail to mention their poisoning of he planet). But a billion people manage to live on backward Tara, and though it is a closed world, an amazing number of trade ships manage to slip through Cygnus security to smuggle their high-tech wares... to fuel rebellion. A SUBJECT WORLD PLOTS REVOLT! 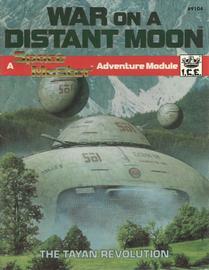 Included are three adventures, set on an induxtria, but technologically depressed planet within the province of Kashmere. Each involves intrigue and danger as agents of the K.I.N. (Kashmere Intelligence Net), battle Regels and assasins of enemy Houses. 1. The Baron of Cygnus' daughter is trapped in an underwater mine accident! Was it an accident - or sabotage by angry rebels? She must be rescued and the truth must be uncovered! 2. A few replicants have survived the Antitelepath Purge of a few months ago. Are they special agents from House Colos sent to cause terror within the Kashmerian society, or desperate refugees seeking asylum from their evil creators? K.I.N. agents must beat the Colosians and capture the replicants alive! 3. 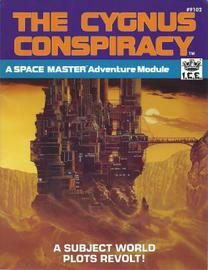 The Conspiracy: Underground Taran leaders have devised a plot to sabotage the planet's defenses and seize control of the worldwide computer net! If they suceed, they could paralyze Kahmerian industry and bring the mighty Cygnus Clan to its knees. Can the K.I.N. thwart them?" "Somewhere out there, In a distant and unsurveyed Sector, lurks a cold and mysterious presence. Amongst the icy remains of his last helpless victims, he hides in the frozen hold of a derelict vessel. He waits and he is hungry. Time passes, and eventually something comes along. More frail human beings have arrived. He stirs from his dormant state into alertness -- food is here. 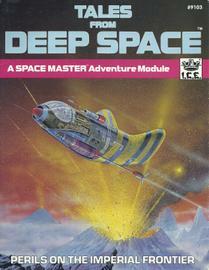 TALES FROM DEEP SPACE includes five ready-to-run adventures, twelve predesigned characters, detailed campaign background information, and a new Insystem Encounter Chart. 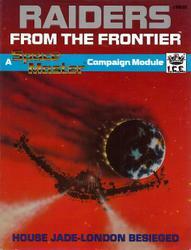 * An alien force attacks a vital orbital laboratory, and the scientists must be rescued. * On a routine Planetary and Racial Survey in the Frontier, you encounter a Xeno-sentient race with potentially devastating power. * In an unsurveyed Sector, an undamaged and apparently lifeless vessel floats abandoned. Is it a fortune in salvage or the legendary Ghost Ship? YOUR adventures will form the cosmic lore of the Empire -- stories repeated and embellished for time eternal, in every Starport and Cantina throughout the Human Sphere." "Fighting for their HomeWorld with little to lose, the rebels of the Tayan Liberation Front have proven themselves a force to be reckoned with. Although Darran Provincial garrisons have been tripled, the rebel bases remain hidden and the terrorist attacks continue. Rumor has it that the Church has requested Imperial aid in the crisis. Can the Viscount of Darran retain control of his crumbling Province? For three centuries the Royal House of Darran has held control of the moon Tayah and its precious organic resources, despite the presence of Clan Tsoros, a race of aboriginal humanoids. The once peaceful cohabitation has now degenerated into guerilla warfare, as the Tsorosians attempt to throw off Darranian rule. War on a Distant Moon™ includes detailed descriptions of the worlds and cultures of the Darran province, star charts and terrain maps, current events and important persons, and five ready-to-run adventures that place you in the center of the action! • What begins as a straightforward locate-and-rescue mission proves to have more than its share of surprises. • A trek across Tayah leads to encounters with alien lifeforms, City Guards, and death squad terrorists. • A search for ship parts turns up much more than spare sensor grids. • A race across 1200 kilometers of rough, freezing terrain in the midst of an Imperial siege sounds easy enough. . .
• Attempting to get out of the system, you find that there's just the small matter of an orbiting Imperial Gunship Squadron. "Without a steady supply of Andrium, the fuel for hyperdrive crafts, Imperial cruisers and provincial merchant vessels would soon drift to a halt, unable to make the jump between stars. The lone supplier of this artificial fuel API, Andrium Producers of the Imperium, an Imperially controlled manufacturer. On a routine mining operation, the Churg—a sedentary race whose pursuits are almost purely intellectual—make an incredible discovery: Durandrium! This naturally occurring, non-decaying element will destroy the API monopoly and provide a power source with unprecedented availability! Enter Augustus-Hayes, a once-prominent Provincial House. Now teetering on the brink of economic collapse, Augustus-Hayes could be the target for a hostile takeover! Can Augustus-Hayes acquire the gravely needed mining and distribution rights from the indifferent Churg? Or will agents of API and other factions thwart this last desperate attempt at financial rescue? · Win the confidence of the Churg and convince them that contracting with Augustus-Hayes is in their own best interest, despite claims by the API to the contrary. Also included is information on the Inner Provincial House Augustus-Hayes, and detailed racial background on the humanoids of Minor Clan Churg." "Thirty thousand years before the formation of the Imperium, a massive colony ship left the Milky Way, bound for a distant galazy. Created by an ancient race, the Azyrri, the Azyr Nebula would launch a genetic Seeding experiment that would take thirty millennia to complete.... Unforseen by the Azyrri, an accident on the ship's return to the Milky Way cuts short the experiment just months before its scheduled termination. The mishap leaves the ship's passengers - two competing races - stranded together on the planet Thurzaj. 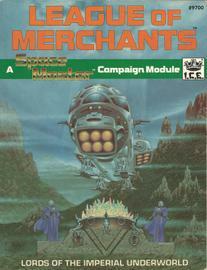 The Azyrri vanish, unable to witness the fate of the craft or its cargo.... But a few bold travels encounter the Nebula on its bizarre, suspended mission. What secrets lie sealed within the Legacy of the Ancients? 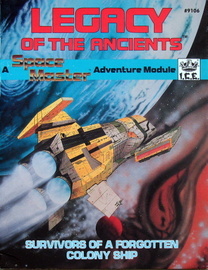 LEGACY OF THE ANCIENTS includes detailed descriptions of the massive colony ship Azyr Nebula, the barren planet Thurzaj, the belligerent Urygan race, and five adventures full of action and intrigue! - A Durandrium rush brings ruthless miners, willing to obtain the precious fuel at any cost. Can you protect the colonists and their priceless vessel? - A party of exploring colonists accidentally triggers a crashed pirate ship's self-destruct mechanism. Can you stop the destruct sequence or relocate the colonists before they and the ship are destroyed? - A young colonist is seized by the deadly bolb-like phlunge. can you rescue him? - Racial tensions rise to a boil. Will you remain aloof, or take sides in the impending fight for control of the Azyr Nebula?" 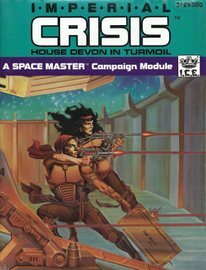 Houses Kubischev-Lloyd and Colos bicker over the rights to a rich ocean world, while Adanis faces a disaster of cataclysmic proportions. A stray asteroid collides with the smallest moon, wreaking global havoc on the planet below. Urgent distress calls issue from Adanis, and both House Kubischev-Lloyd and house Colos respond. · Deep under the waves of Adanis’ tropical seas, survivors of an earthquake and huge tidal wave are trapped in a damaged Sea Bed Farm. Will help arrive before provisions and air run out? · Kubischev-Lloyd officials hire you to retrieve a list of colonists and employees involved with a titanium mine. Can you survive the hazards of the mine to complete your mission? · While investigating a sensor anomaly on Adanis’ surface, you may find an unpleasant surprise. Are you prepared for unforseen danger? 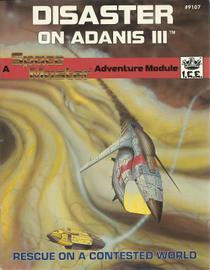 DISASTER ON ADANIS III is designed for use with ICE’s SPACE MASTER Science Fiction Role Playing system, but the material is easily converted for use with other systems." "Long ago, before even the Empire, there was Devon Electronics: a huge corporation dominating the microcircuitry market. It survived nuclear conflicts, the expansion of mankind into space, and the repressive Terran Federated Democracy. Devon Electronics — and a handful of other Megacorporations — also weathered the Wars of Integration and the consecration of the Terran Empire. However, the Corporation has changed, Devon’s power has spread to encompass entire star systems. It is more than a Company: it is a Government. House Devon, ruled by Lord Yama Pythagor III Devon, now holds sway over a rich Inner Province in a feudal arrangement with the Emperor. For thousands of years Devon has thrived, but now strife — internal and external — threatens to undermine the power of the Family and so the very existence of the Province. 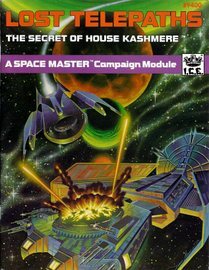 This first Space Master Campaign Module details an Inner Province of the Terran Empire: House Devon, constantly under attack both openly and subversively by the rival family Colos, threatened by uprisings by Minor Clans within the House, and always on guard against pirates, smugglers, and interstellar terrorism. 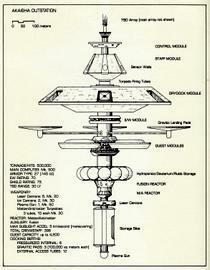 "Astra’s launch occurred without incident, but soon thereafter a problem in the astrogation program developed. Whether it was equipment failure or sabotage will never be known. For several hundred years the Astra drifted through space, off course. Assuming a rogue star to be the planned destination, the ship decelerated and prepared to orbit the star’s only planet. • “Just a simple gun run” the Leaguemaster told you. He forgot to mention the brutally efficient customs officials, and who knows what else the Telepaths might do to stop you..."
"In the power hungry and paranoid world of Space Master, no region breeds as much avarice and distrust as the Frontier. Here, beyond the reaches of the Core Provinces, resources are still “up for grabs.” It is no surprise that the Emperor keeps a close eye on Frontier events, especially the discovery and exploration of new worlds. Imperial Observers (I.O.) nearly always accompany exploratory missions, scrutinizing development. Still, there are those clever groups which manage to evade investigations—by hook or by crook! "Thick mists hang on the cliffs of Hestus V, settling over the dark forests. The League exploration ship, Cleopatra, slides silently through the churning clouds, evading Provincial scans. Suddenly she bursts from the low ceiling over a narrow vale. Below lies what the Cleopatra seeks; flanked by a pair of waiting Ghedian priests crouches a huge cauldron, brimming with prismatic light. Beautiful crystals glow with an inner fire, for their energy is Psionic power beyond belief. Such power might control even the Empire. Enter the sinister realm of the League of Merchants, a dynasty of thieves, terrorists and crime lords spanning the Terran Empire —and beyond. Their shadowy tentacles have found their way into every aspect of society, masterminding illegal operations; from raiding ancient ruins to controlling provincial governments. 1. Plunge into an exciting mission where blackmail, doublecross, and the violent sport of Power Raking combine into a complex League frame-up. 2. Discover the cause of disturbing events on board your ship after lone drifting traveler is retrieved from space. 3. Attempt to enter Starhaven, the League stronghold guarded by bloodthirsty killers and ancient machines stolen from the crypts of the Old Ones. 4. Steal a unique artifact of the supposed long dead K’taviir Empire from Imperial Archaeologists. 5. Travel to the quarantined world of Hestus V and discover its coveted mysterious power. "Graced with abundant resources, Jade-London is envied as one of the Empire's most powerful and wealthy provinces. Jadium, a metal useful in the contruction of starcraft, can only be found here. Jade-London also acts as a buffer between the Imperial core worlds and the Idorian Star Empire. The Idorians are cruel, blood-thirsty humanoids determined to disrupt the Terran Empire. Infamous for their disrespect of life and property, these pirate-raiders are believed to be responsible for recent strikes against remote Jadist mines. Plenty of Houses would enjoy undermining Jade-London's materials industry. Raiders from the Frontier chronicles the conflict between House Jade-London and its various foes, including the terrifying Idorians. Provided are the history and structure of Jade-London, background on the Idorians, and 4 adventure scenarios which embroil you in the troubles of Jade-London. 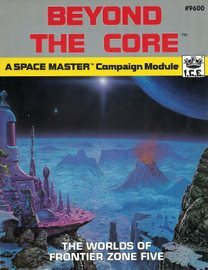 - Uncover a conspiracy to disrupt Jadist mining in the hazardous asteroids of the "Ring of Heaven." - Transport twelve "special personnel" to a remote mining station. - Encounter a de-evolved culture which has sunk to violence and treachery. - Rescue the count's son and heir from Idorian rebels. - Background and Stats of Jade-London's leaders and personalities. - Descriptions of Minor Clams within Jade-London's sphere of influence. 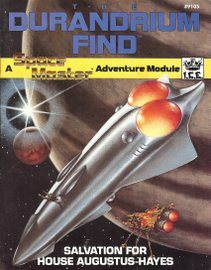 - 4 Complete Adventures, including layouts for an Orbital Space Lab.